Summary: Design, supply and install SG425 section plastic sheet piles to form a permanent cut off wall to a flood alleviation bund wall. 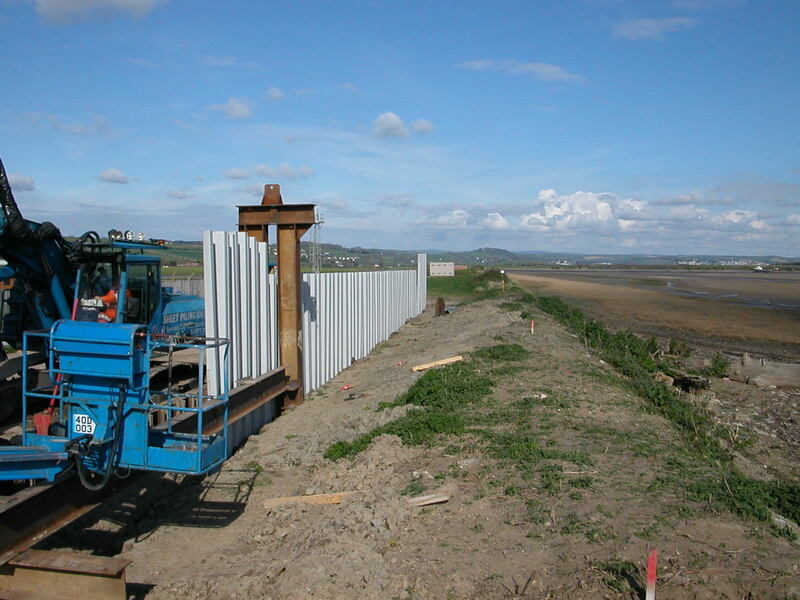 Sheet Piling (UK) Ltd were employed by Principal Contractor BAM Nuttall to design, supply and install a plastic sheet pile cut off wall as part of a flood alleviation scheme on the North Devon coast. The design required SG425 section plastic sheet piles, produced by CMI, in 6 metre lengths to be installed to a depth of approximately 3.5 metres below existing ground level. The sheet piles were then encapsulated into an earth bund wall. The soil consisted of approximately 0.5m of topsoil overlying approximately 2 metres of stiff gravelly clay overlying weak mudstone. A total of 167 No. sheet piles each 600mm wide were installed giving a total wall length of approximately 100 linear metres. The sheet pile line was predrilled to overcome possible obstructions in the ground, and a guide frame was set up on steel cruciforms which were driven into the ground using the vibro hammer on the telescopic leader rig. The interlocking plastic piles were installed using an ABI telescopic leader rig with 600kN vibro hammer and a patented ‘Stabcat Stompper Mandrell’. The sheet piles were clamped into the steel mandrell, which was then locked into a keyway on the gates and driven to level by the vibro hammer. The flippers holding the sheet pile to the mandrell were then released and the mandrell removed ready for the next sheet pile. Each gate set up can accommodate Approximately 16 No. sheet piles and an average of 10 No. sheet piles were achieved per day,Including the installation and removal of the guide frame system. On completion of the works the plastic sheet piles were cut off to the required slopes and levels using an angle grinder.